Nevertheless, I have encountered some gems along the way. For example, before I started processing the materials, the Archives had just one photograph of Joe Bell, who started as a keeper, became Head Keeper of the Bird Department in November 1957, Assistant Curator in 1963, and held various Curator and Chair positions from then until 1981. This lone image—which didn’t even clearly show his face—has now been supplemented with photos such as this one, showing Bell measuring one of several young torrent ducks that had been hatched at the Zoo from eggs gathered in the field. Another highlight of processing the collections has been encountering pleasant—or sometimes just odd—surprises. 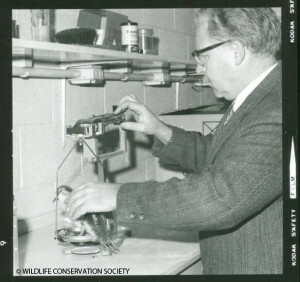 In the case of these two documents, correspondence between New York Zoological Society Ornithology Curators and their colleagues near and far provided just those sorts of ‘A-ha!’ moments I earlier said were relatively rare. 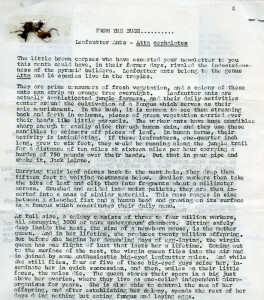 Belize Zooletter, March 1985, page 6: “From the Bush” feature on leafcutter ants; click on image to read text more clearly. The first is one of the early newsletters distributed by Belize Zoo founder Sharon Matola. 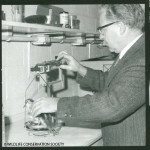 While Matola and Don Bruning corresponded fairly regularly in the mid 1980s, Matola’s Belize Zooletter updates are as, if not more, impressive than her letters. 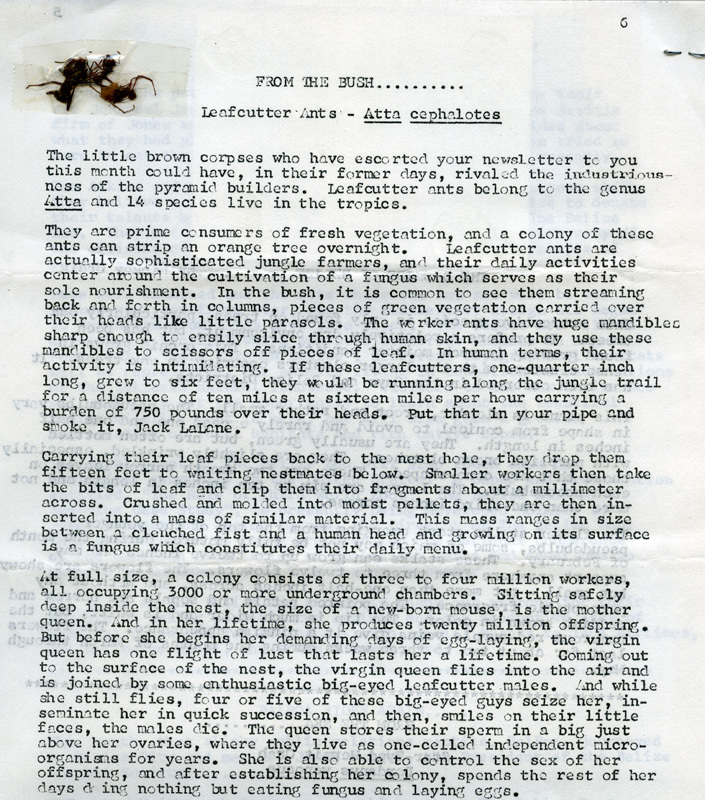 Each issue of the Zooletter included several photographs glued to the photocopied newsletter pages, and most also included biological specimens (for example dried leaves, seeds, various ants, or other bugs) taped onto the paper as well. Not wanting to risk either damaging the paper by removing these items or having the biological material attract pests, I’ve instead encapsulated each issue in an archival plastic zip-lock bag. The second item thankfully needs no isolation treatment. 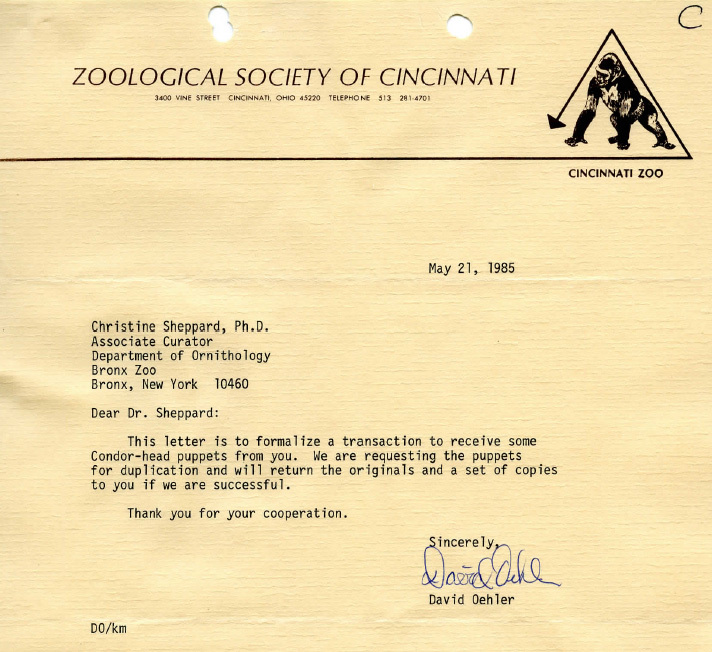 It is part of a series of correspondence from spring 1985 between Associate Curator Christine Sheppard and the Head Keeper of the Bird Department at the Cincinnati Zoo, one David Oehler (who just happens to be our current Curator of Ornithology). In the early 1980s the Bronx Zoo had successfully reared condors for release into the wild; in 1985 the Cincinnati Zoo was considering an exhibit featuring condor puppet-heads like the ones used here in the Bronx. Sheppard had, on Bruning’s suggestion, asked Oehler for a formal document detailing the transaction for the record. This letter, the last in the series that I’ve come across so far, served as a loan agreement for the puppets. 1985 Curatorial correspondence, “C” file: May 21, 1985 letter from David Oehler (Head Keeper, Bird Department, Cincinnati Zoo) to Christine Sheppard (Associate Curator, Department of Ornithology, Bronx Zoo). Click on image to read text more clearly. Note: A version of this post appeared in the Fall 2015 issue of the Ornithology Department’s internal newsletter, Neornithes News.